Kurt of Gerolstein: David Stone's Three Wishes: Number Two .. granted! David Stone's Three Wishes: Number Two .. granted! George Bentham was born in York in 1843, the son of Captain (later Lieutenant-Colonel) John Bentham, (d Torquay 9 October 1858) variously of the 6th dragoon guards, 52nd Light Infantry and the 3rd East Lancashire Militia, and the son of an army General, and his Leeds-born wife Emma Sophia née Ikin ‘youngest surviving daughter of Thomas Ikin, Esq of Leventhorpe House’ (m Brotherton, 7 February 1839). The family was well-connected, and in the 1851 census John and Emma, with daughters Harriet Mary Considine Bentham (10) and Caroline (9), and son George (7), can be seen living with Emma’s widowed brother, Thomas Bright Crosse, ‘magistrate and deputy lieutenant’ and some time MP for Wigan, at Shaw Hill, Whittle le Woods, Lancs, in a household which also includes a governess and nine servants inclusive of two nurses, a nurserymaid and a governess. The Crosse family ‘of Crosse Hall, Chorley’, as well as being of ancient lineage, were decidedly well off. The young George took employment in the war office. Having discovered an attractive tenor voice, he also got involved in the amateur music-making which was a feature of high society life in London, and by 1866, the date of the first concert programmes I have dug up in which his name appears, he had won his way to the top of that particular tree. A couple of months later, he is at Torquay, singing at a concert given by ‘some members of the Wandering Minstrels’. The Wandering Minstrels was the foremost gentlemen’s amateur singing club in Britain, and it appears that George Bentham had, at 22 years of age, already risen to be a soloist with them. Later in the season, he and Mr Whitworth Jones (the former very appreciable professional opera basso known as ‘Henry Whitworth’) were the soloists in a very high-society concert given by the group at the West London School of Art. At the end of March, he featured in the concert of the Civil Service Musical Society at the Hanover Square Rooms, and this time the London critics added their praise: ‘he has a beautiful tenor voice which was heard to much more advantage in Mr Frederick Clay’s very graceful song ‘The Shades of evening’, accompanied by the composer, than in the not very interesting air (balata) by Donizetti ‘Il pescatore’. Besides possessing a voice to excite envy, Mr Bentham has real musical feeling and sings with expression as true as it is unaffected.’ Along with his ballads, George also tackled opera, joining a Mr Swain in a duet from Mercadante’s Eliza e Claudio. The magic name. It had to come. For indeed, the two men were drawn from one and the same well. Both came from a wealthy and high-social background, and both had fine, true English tenor voices with, it seems, true upper class English enunciation and pronunciation. Both had been stars of the Wandering Minstrels. Both had been civil servants. But Thomas Hohler was a particular case. Rare it was – and, indeed, I can think of no other previous example -- that a society amateur should quit the amateur ranks and take on a full-sized career as a professional vocalist. Most didn’t want or need to. Singing was a pleasurable and social activity not a job. But just a few years earlier Hohler had done it, and done it with more than a little success. George Bentham would follow where he had led. Quite where and how he started his transformation, I do not know. He is still there in May of 1866, singing at Civil Service Society concert (‘he created quite an effect with the audience’), but he then disappears from my view for the whole of 1867. Studying in Italy? And mythology (on the say so of the Musical World) credits him with his having ‘made his operatic debut in Brussels Théâtre Italien du Cirque under the name of Bentami in 1869’. Which is certainly not right. My first sighting of the remade Bentham is in 1868, when a correspondent of the Musical World writes from Copenhagen in to report on ‘a new English tenor’ who is appearing there in Il Trovatore ‘a great surprise… a soft, sonorous, sympathetic voice ... intonation as pure as the sound of a silver bell’. When he sang Rigoletto, alongside Pantaleone and Mlle Calisto, the local music press credited him with ‘eine hübsche Stimme, aber kein Spiel.’ By October, the reports are coming from Amsterdam where he is ‘primo tenore in the opera of the city’. ‘He has just signed an engagement as primo tenore for the Royal Theatre at Stockholm for ten weeks’. After that, it seems, he proceeded on to Italy. For, when he finally made it back home, he was billed as being ‘of the principal theatres of Italy’. It is always a suspicious bit of terminology, that is, and the truth of the matter is usually that the unnamed principal theatres are nothing of the kind, if indeed they exist at all. But anyway Bentham was on his way in his new career, and good tenors being as hard to find in the C19th as they are in the C21st … it is likely that he found gainful employment wherever he may have been. The career of Tom Hohler had been launched, in April 1866, by Mapleson of the Italian opera and the experiment had been a success. Now Mapleson put the newest civil service tenore under contract, and George Bentham was able to return to Britain with a three-year contract for the Italian opera house in his pocket. He began the British part of his professional career in Scotland (March 1871), where Mapleson’s company was playing a pre-London season. Glasgow voted his Almaviva ‘manly and musicianlike’, Edinburgh reported that as Elvino, to the Sonnambule of di Murska and of Sinico, ‘his tasteful vocalisation elicited hearty applause’, and as the company headed south Birmingham approved his ‘voice of agreeable quality … ‘ though finding ‘his acting and singing somewhat amateurish’. He made his London debut playing the role of Carlo, opposite Ilma di Murska, in Linda di Chamonix (20 April 1871) and the critical response was fairly satisfying. But only fairly. The Times opined that ‘he must abide his time and acquire experience. That he possesses a voice to be envied none can dispute; moreover, he has talent into the bargain’ and added that he was much less nervous on the second night;another print referred to him as ‘a cultivated English amateur’ and compounded ‘… a nice tenor voice of the tender rather than the robust order and of these there is always an ample supply. His manner is quiet and modest, and his style careful, neat and small, more suited for musica di camera than the area of the Grand Opera’. The Musical World commented on what it considered to be nervousness, but continued ‘there was however much to commend …’ and ‘that he possesses a voice to be envied is beyond dispute’. The ‘new tenor’ was much in demand. On the 20 May he appeared at the New Philharmonic concerts in a concert version of Idomeneo alongside Therese Titiens, two days later he shared the vocal duties with Clarice Sinico at the real Philharmonic Society, giving ‘Un aura amoroso’ and provoking the review ‘ .. a delightful tenor voice but much to learn’. It was a refrain he would hear often in the years to come. On 24 May Idomeneo was repeated, on 25 May he joined di Murska, Edith Wynne, J G Patey and Janet Patey, Sims Reeves, and Sig Foli as soloists with Henry Leslie’s choir, and in the early days of June he appeared with some of his opera confreres at the Crystal Palace, took part in Mr Aptommas’s concert singing Donizetti and joining in ‘Un di se ben’ (‘he improves’), Wilhelm Kuhe’s concert, Wilhelm Ganz’s concert at St James’s Hall, sharing the vocals with Titiens, Natalie Carola, Vernon Rigby and Jules Lefort, and at Henry Leslie’s concert with a large portion of the opera company. When he appeared at the Royal Dramatic College concert on the stage of Her Majesty’s Theatre, he exhumed an old friend and ‘charmed the audience with a pretty song by Frederick Clay called ‘Shades of Evening’’. And in the midst of all this activity he launched into a new role at Her Majesty’s, featured as Idreno to the Semiramide of Titiens, alongside Trebelli, Agnesi and Foli. ‘A tenor part only to be completely filled by an intelligent singer ... [he] added to the general efficiency’. And then, on the occasion of Mapleson’s Benefit in July, he was put forward as Lionel in Martha. The press commented‘years back petty jealousy and prejudice would have given a young English tenor no such chance as that which has favoured Mr Bentham’. The concert engagements continued on till the end of the season, and in the interregnum between the London opera season and Mapleson’s provincial tour, George snared another top job: an engagement at the Gloucester Festival, sharing the tenor music with Vernon Rigby and Edward Lloyd, and alongside Titiens and Foli (Elijah, selection Azor e Zemire). Presumably he didn’t sing on the last day of the Festival, 8 September, for that day he was in London, at All Saints Church Kensington, tying the knot with twenty year-old mezzo Cecile Fernandez. The newlyweds duly crossed to Dublin, where George stepped in to deputise for Vizzani in Il flauto magico and Cecile scored a success with her Smeaton in Anna Bolena. But Mr Bentham took umbrage when Zélie Trebelli was then given the role of Smeaton, refused to allow Cecile to go on in Il flauto magico, flaunted off with her to sing in Halle’s concerts in Manchester and booked them for Brighton in defiance of their Maplesonian contracts. As then the troupe proceeded on to Liverpool and dates beyond, Bentham was still with them, but he doesn’t seem to have done much. It seems he may have been suspended. Anyway, his manager sued him claiming he had ‘violated his contract by singing at the Gloucester Festival and at Dover last Sept without consent’. And so, it was back to the concert halls -- the Crystal Palace with ‘Il mio tesoro’, ‘Ah si ben mio’ and the like, Ganz’s Saturday evenings with ‘O cara imagine’ -- and to reviews ranging from ‘there is little doubt that he will ultimately become one of our most popular tenors’ to the too familiar ‘he ought to do more than he does with so much voice as he possesses’. And then they were up and gone. Mr and Mrs Bentham quit England and headed for Italy. News seeped back to Britain of their performing – one, the other or both – in Udine, at the Pergola in Florence, at the Teatro Bellini in Palermo. 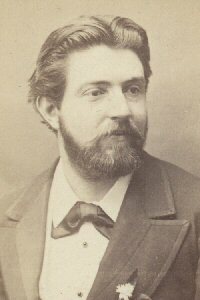 In January 1873 he sang Faust and she – for heaven’s sake – Marguerite in Malta to enthusiastic reviews, and in June he was reported singing Don Pasquale in Saenza. She was doing Rosina in Ferrara. When, that is she was not giving birth, in Florence, to a little Jack A Bentham (24 March 1873). Later, he turns up at the Teatro delle Valle in Rome (L’Ombra). I don’t know what happened to little Jack, but something seems to have happened around about this time to George and Cecile. Like, he returned from Italy and she stayed. Playing at the Teatro Malibran in Venice. And when she does return, they are no longer working together, as they so often were before. And, according to the censi of 1881, 1891 and 1901, neither are they living together. She still bills herself much of the time as Madame Bentham-Fernandez, or Fernandez-Bentami or other suitable variation. But sometimes she is just Cecile Fernandez. It does seem as if the marriage may have had a very short effective life. Back in London, George began to work. He took part in the Monday pops (‘O cara imagine’, Mendelssohn song) and replaced Vernon Rigby in the London Ballad Concerts delivering ‘The snow lies white’ and his faithful ‘The Shades of evening’, he insisted on ‘Salut, demeure chaste et pure’ at the British Orchestral Society (‘Mr Bentham proved his advance as a vocalist but to be frank he has yet much to learn in point of style’), returned to sing with Henry Leslie’s Choir and appeared in concert at the Albert Hall (‘When other lips’). And then, on 27 April, he reappeared with Mapleson at Her Majesty’s Theatre. A Faust for whom ‘Salve dimora’ is beyond his powers? When Faust was on the bills again, Italo Campanini and Christine Nilsson took the star roles. I suspect George Bentham may have been hired as a spare tenor or a general tenor understudy. However, later in the season he was given a Tamino to play. ‘His chief fault was his lack of animation’. There was always a fault of some kind, it seems. When he again played Tamino on tour, the Liverpool critic grumbled that he was ‘scarcely equal to the demands of [the part]’. But engagements were not lacking. In September he returned to the Gloucester Festival, singing in the Rossini Stabat Mater with Titiens, Trebelli and Agnesi, Weber’s The Praise of Jehovah, Rossini’s Messe Solenelle and the tenor music in Elijah (‘beautiful voice and faulty intonation’), and when that was done he continued on to the Liverpool Festival (29 September) where the other tenors engaged were Sims Reeves and Edward Lloyd. On 14 October he joined Campanini and Lloyd as the tenor department at the Leeds Music Festival (‘an agreeable tenor voice … not always free from errors .. painfully flat’), and in November he travelled to Edinburgh for a performance of Benedict’s St Peter. In the early part of 1875 he sang another Elijah, teamed with Marie Roze, Antoinette Sterling and Myron Whitney, at the Albert Hall, and yet again there was complaint about his intonation. Not something that had ever been a problem before. In 1876, George Bentham returned to the operatic stage. But this time it was not the Maplesonian opera. Those days were gone. He joined up with something called the Imperial Italian Opera Company, a touring outfit of dubious stability run by the ambitious Scottish baritone who called himself Enrico Campobello. It had a limited life, during which George sang Alfredo to the La Traviata of Emma Howson. In the early part of 1877 he, however, returned to Mapleson. Not for opera this time, but for a very superior concert party tour which featured Titiens, Alwina Valleria, Agnes Bonn, del Puente, Brocolini and Borella. And in Manchester the press was able to report ‘he has seldom been heard to such advantage..’, ‘he has an exceptionally fine voice under perfect control and his singing was thoroughly artistic’. No faulty intonation? No lack of energy? No ‘voice on legs’? All those faults which George Bentham had seemingly had since day one, and of which he had apparently never succeeded in getting rid, had they all disappeared at last? Would and could his career, at 33 years of age, finally take off like Hohler’s. The job that George Bentham got in the last part of the year 1877 was precisely the one that could and should have suited him to perfection. That could and should have allowed him to achieve that take-off. He was cast in the leading tenor role of Alexis in Mr W S Gilbert and Mr Arthur S Sullivan’s brand new English comic opera The Sorcerer. It should have been a doddle. Ideal casting. The music was exactly right for his not too robust English tenor voice. And act? He didn’t have to act. He simply had to play himself. With a certain amount of burlesque humour, of course, or at the least of understanding of burlesque humour. Well, the often-told tales of the events surrounding the creation of the various Gilbert and Sullivan operas have told us that it wasn’t a doddle. George Bentham wasn’t bad as Alexis. He just wasn’t good. It seems that the humour of the thing escaped him. That even acting himself didn’t make him act convincingly. And that the languidness which had apparently always affected him as a performer was still there. George Bentham played the role of Alexis for the opening months of the run of The Sorcerer, and then, when the show’s initial touring company was sent on the road, he was redeployed to play his original role in the provinces, whilst another upper-class – nay, aristocratic -- English tenor, George Power, took over at the Opera Comique. George Power would go on to create the tenor roles of HMS Pinafore and The Pirates of Penzance during his handful of years in the professional theatre. And George Bentham? Once the tour of The Sorcerer ended, he simply and quietly removed himself from a musical profession in which he seemingly could find no suitable niche. No place where he could sing Freddie Clay’s ballad, and little else. Age thirty four. George Bentham ‘of independent means and no fixed abode’ was 67 when he died at the Strand Palace Hotel in 1911. Fatty degeneration of the heart for unnumbered years leading to a sudden heart failure. He had been ill, reported his death certificate ‘for a few minutes’. The still official Madame Bentham didn’t come to register his death. ‘A T Crosse, cousin’ did the honours. ‘No fixed abode’ seems to have described this lost, vaguely talented man rather well.